TENS machines (Transcutaneous Electrical Nerve Stimulation) are used in hospitals for pain relief. Now portable TENS machines are available for discreet use anywhere. TENS machines have been used in hospitals for a number of years, especially for the relief of labour pains during childbirth. However, they have also been found to be effective in the relief of some musculo-skeletal pain such as back injury, scoliosis, arthritis or osteoporosis. Whilst TENS machines do not work for everyone, there are now portable TENS machines on the market, the popularity of which would suggest that they are bringing some degree of pain relief to many people. Pictured above are examples of the most common types of portable TENS machine. It is the size of a small notebook or personal stereo. It is available cordless, running on a long life battery. It often comes with fully adjustable programmes for particular ailments. An LED display and timer all aid convenience of use. The pads which attach to the body are invisible under clothes and the TENS machine will fit into the pocket. Therefore, this type of portable TENS machine can be used discreetly for pain relief when out and about. A recent innovation is the portable TENS machine in the shape of a pen, such as the models shown above. It delivers pain relief directly to the desired spot without the use of pads or wires. It can be carried in a briefcase, handbag or pocket. This type of portable TENS unit is effective through clothing. It releases pain-killing endorphins through a low frequency electrical charge transmitted by the use of crystals situated in the pen. The tip of the pen is placed on the site of pain and a button is pressed a number of times, releasing a small electrical charge. These units require no batteries and last approximately two to three years. Unless you are using the 'pen' model, small electrode pads are placed on the skin where the pain is felt. The TENS machine emits a small, low-intensity electric charge through the pads. The frequency of the TENS machine can determine the kind of pain relief administered. On a high frequency, the TENS machine stimulates non-pain nerve fibres which send signals to the brain blocking the pain-carrying nerve signals. On the lower frequency, natural pain relief hormones called endorphins are released. Those who have a pacemaker and may suffer from heart disease. Anyone who has an undiagnosed pain. Women who are pregnant (except in labour). According to the BBC’s Health website, the Pain Research Unit at Oxford University published a review of TENS in 1997. They could only find weak evidence for pain-relief in childbirth through the use of TENS. However, there has not been any substantial study since then. In addition, they note that the jury is still out as to whether TENS is effective for chronic pain, but again, some experts believe that more research should be done in this area. It is advisable to bear in mind that pain is an individual matter and what certainly seems to work for one person suffering acute pain, may not work for another. Therefore, before purchasing a portable TENS machine, a patient should consult his or her doctor. TENS machines should be seen as part of an overall pain management programme and may help to reduce the amount of pain-killing drugs a patient is taking. The doctor may also be able to advise on hiring a TENS unit before committing to buy. It should be borne in mind that portable TENS machines are completely natural, drug-free, safe for most people and have no known side effects. However, there are certain areas of the body and certain circumstances where TENS should not be used. It is therefore wise to read the instructions that come with a TENS unit very carefully. Where they do relieve pain, portable TENS machines help users to feel that they have a degree of control in their pain management. This in itself is an important factor when living with pain. Hello Kimbesa - I really do think they are handy to have around. 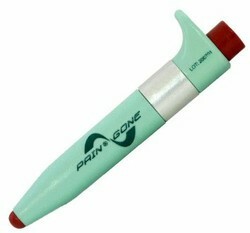 I've got the Pain Gone pen one - I've found it invaluable. I haven't had to use it for a while thankfully. I had some TENS years ago, and I thought it helped me. I've been thinking about it again, so your article is very timely!